Why Join the San Rafael Chamber? The San Rafael Chamber of Commerce is one of Marin County's leading business advocates. We are strong champions for local business interests and work vigorously to maintain a healthy economy. We are equally proud of the valuable products, programs and services we provide for our members. SAVINGS: Chamber membership grants you the ability to take advantage of special offers from Comcast and Office Depot that can save your business hundreds of dollars. 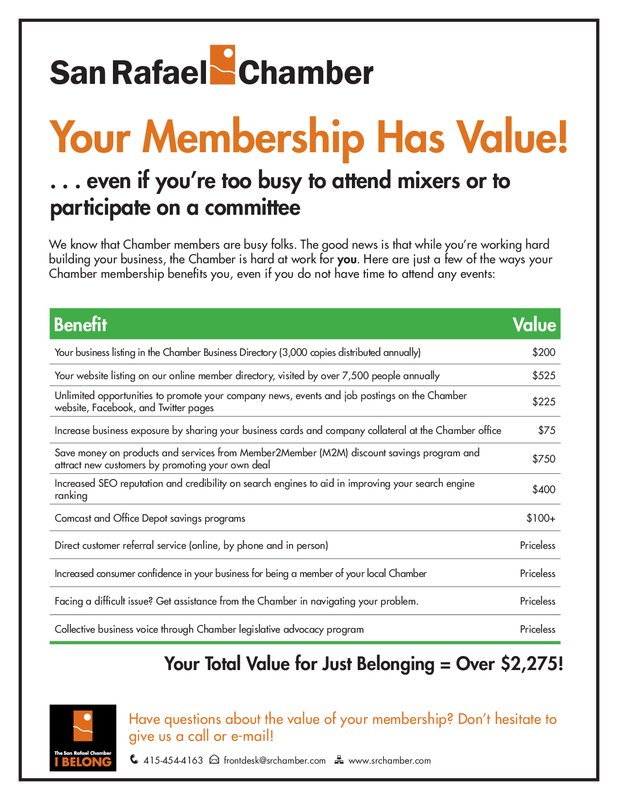 You can also take advantage of the direct discounts on products and services from fellow Chamber members through our Member2Member program. View a full listing of member benefits! "This Chamber does an outstanding job of building community to make San Rafael an amazing place to live and play!"